Keren rolled a few of the large, red pills around in the palm of her hand with her index finger. 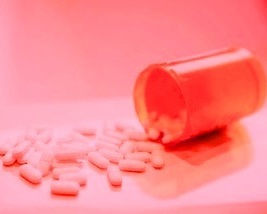 Take one, twice a day, she whispered, as the pills rolled off her fingertips into the toilet. She picked up the amber prescription bottle from the sink counter, turned it over and the rest of the pills tumbled into the water. When she flushed, the red spun slowly, like a thick clog of blood. The pain in her belly was daily and increasing. But she couldn’t bring herself to be reminded two times a day that the cancer might devour her as it did him. The more she thought about it, the more the pain burned. It stabbed hot in her side like a machete cutting away the years of her life. She felt conflicted about whether her father had done all he could with his disease. He could have eaten better, but so could most. He could have seen the doctor more often and he could have been more informed. She used to think about the could-haves, but now she wasn’t sure anything would have stopped it. The one thing she did know is that he took those large, red pills every day. When he died, Keren’s naïveté vanished and she knew nothing could stop what might come. Not food, not doctors, nor the large, red pills. And though the pain stole her life, it was better than the yellowing, screaming death of her father. She looked back into the hole of the toilet and saw a few red pills swimming at the bottom. She flushed again and they were gone.